I chose Raymarine for Grace when we bought her in 2015 (see my network design here) because of how impressed I was with their MFD usability and software update frequency. I started getting worried in late 2016 when that frequency dried up, but a few days ago they released an update that hopefully signals future releases until LightHouse 3 is ready for older MFDs. 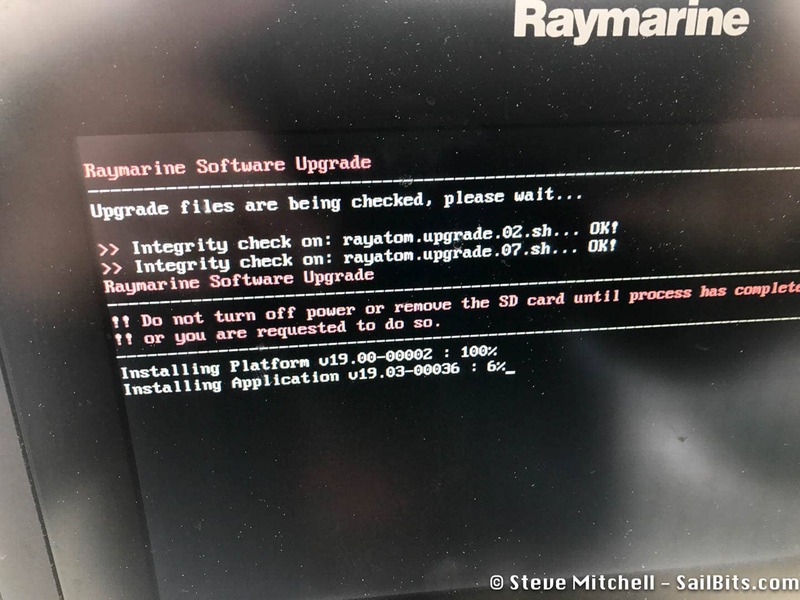 v19.03 is available on the Software for Raymarine site and appears to be focused on a few feature improvements, and indicated that upgrades were available for a lot of the hardware I have on Grace. Strangely, only two items needed to be upgraded according to my eS75 MFD – the MFD itself and the Evolution Autopilot ACU-100 unit. The release notes indicate that there are software upgrades for my p70 and ST1-STNG converter, but neither one showed up as needing new software. I’m hoping this isn’t a mistake or error on their part – last year I had part of my auto pilot out of sync because their update process didn’t think it needed new software. Perhaps they just got updated in a previous release? The features listed include support for thermal cameras, gS-series MFD touch, and Navionics dock-to-dock autorouting. That last “feature” looks more like a bug fix to me. The MFD upgrade process completed without issue – the overall download was about 280MB. As soon as that was done, I updated the ACU unit. While that was happening, I went looking for what has changed in the R4 Evolution update. I applied part of the R4 update last summer, but the overall features that this has enabled are on Raymarine’s site. The only thing I could find was that I upgraded to v2.23 which lists a feature of “initial release for the ACU150” which is documented on the ACU software update page. As far as I can tell, this appears be a new smaller ACU unit for power boats. My ACU-100 came as part of the EV-100 Sail package. After doing the update while at Blake Island, I recalibrated the auto pilot, and used the whole system on the way home. I didn’t see any issues, and everything functioned just like normal. I’m glad that Raymarine released an update, but from the release notes I see no new features, very few bug fixes, and not much else. I’m still worried that they have spent all of their time on the new MFD they announced recently, and LightHouse III. From what I have read, LH III won’t have all of the LH II features on “older” MFDs like mine (less than 2 years old) for a while, and we could likely be in a feature desert for a while. Disappointing, as the rest of the industry seems to continue to provide new features across the last 2-3 major revisions simultaneously. In Ray’s defense, though, they have supported LH II since 2011 (!!) which is a 6 year run, and across a ton of different and very old MFDs.